After playing with ehow for a couple of weeks, I have found there is ZERO quality control while Google just loves the content, it’s a complete joke. As an SEO, we love to find strong trusted domains which we use to rank content and get links from, but there is a trade off. We don’t want the internet to become one large cesspool. My ‘How to link build’ was written in under 10 minutes and is ranking on page 1 for the phrase, this kind of domain trust just encourages spammers (like me :)) to produce crap. 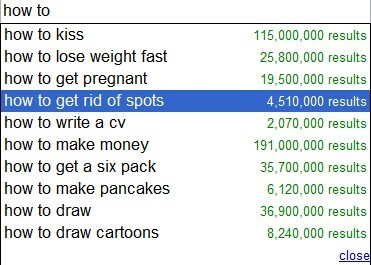 Looking at Google’s predictive search results on ‘how to’ is entertaining in itself. But I started looking for ehow pages and they do very well, usually on the first 3 pages. They may not all be page one, but these results are here without any promotion, purely from ehow’s domain trust and authority. So where are the ehow pages then? To get these types of ehows on page 1 of the search engine results pages (SERPs), you just need some internal links, add a couple of cheap external links and you’re there. But why does Google trust the ehow domain so much? Because they get their cut of the profits to the detriment of their own index? Along with polluting Google’s index with nonsense, ehow is getting more criticism about their evil doings on how badly they treat their authors. The only people really making money here are ehow and Google. For the average internet user I believe ehow pollutes the index with crap, but it does highlight the SEO tactic of using strong domains to hijack SERP positions through ‘piggybacking’. Interesting viewpoint as this is the first time I have heard critcism of ehow. I have used ehow but only a few times so that I can have some presence. Completely agree – it makes our life so much harder as well! The internet is getting so much bigger all the time, which makes it even harder to get found – it’s no longer a case of who can shout the loudest, it’s more of a case of who can shout the most. Internet marketing is hard enough without all this information trash out there.